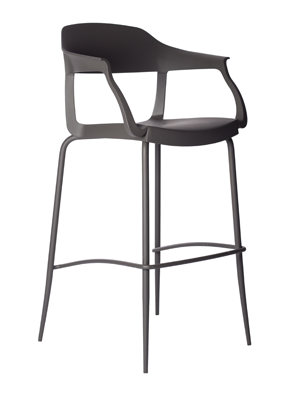 Etoile, a name not standing only for glamour but also for technology, over every convention, today in the new barstool version. Appeal and technology: once again we tried to join and valorize them in a very comfortable chair. To obtain the best performance in terms of strength, stability and comfort, we used the highest technology, calling every detail into question, just adding the right touch of class. Light, stackable, approachable, available in two heights in a modern range of colors, Etoile Bar emphasizes a sharpen behavior. 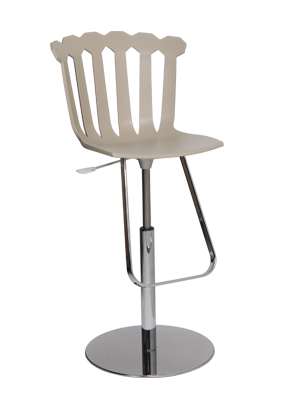 The Evo Gas P adjustable barstool has a sculptural pedestal that blends harmoniously with the seat and a gas-assisted adjustable lift. Sinuous, ergonomic and incredibly versatile, thanks to the flexibility of color combinations. 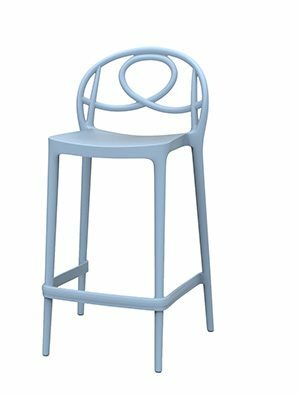 With seven color choices for the polypropylene seat and back, there are actually 49 possible color combinations available for the Evo Gas P adjustable barstool, allowing for an extremely custom look, "on-demand". 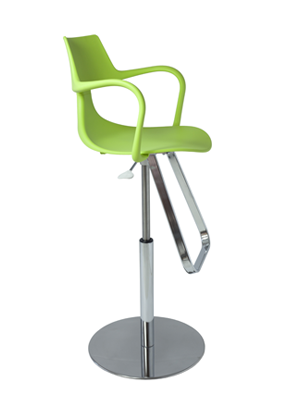 The Evo Gas adjustable barstool has a sculptural pedestal that blends harmoniously with the seat and a gas-assisted adjustable lift. 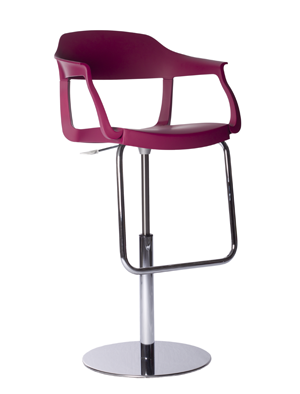 Sinuous, ergonomic and incredibly versatile, thanks to the flexibility of color combinations.With seven color choices for the polypropylene seat and back, there are actually 49 possible color combinations available for the Evo Gas adjustable barstool, allowing for an extremely custom look, "on-demand". 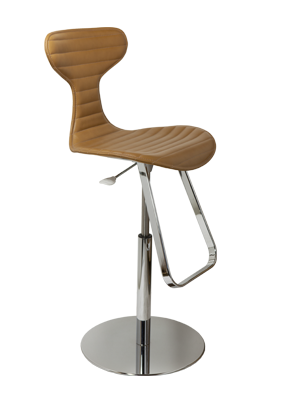 The Rivet Punk-P Adjustable Barstool has a sculptural chromed pedestal that is enriched by an elegant leather seat with gas-assisted adjustable lift. Sinuous and ergonomic, the Rivet Punk-P achieves the perfect balance between modernity and classic taste. Available in thirteen leather options. The Rivet Shark Adjustable Barstool has a sculptural pedestal that blends harmoniously with the seat and a gas-assisted adjustable lift. Sinuous, ergonomic and incredibly versatile, thanks to the flexibility of color combinations. 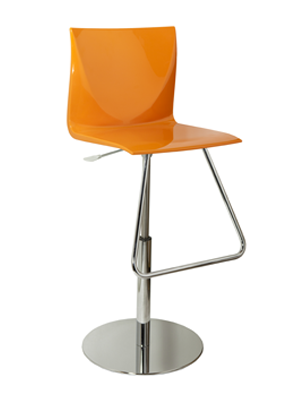 With seven color choices each for the polypropylene seat and back, there are actually 36 possible color combinations available for the Rivet Shark Adjustable Barstool, allowing for a one-of-a-kind setting. The Rivet Punk Adjustable Barstool has a sculptural pedestal that blends harmoniously with the seat and a gas-assisted adjustable lift. Sinuous, ergonomic and incredibly versatile, thanks to the flexibility of color combinations. 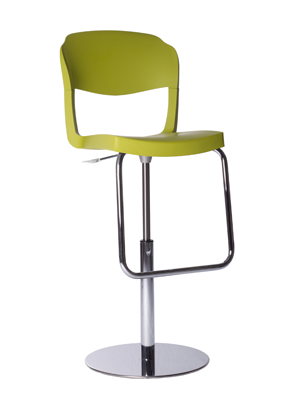 With seven color choices for the polypropylene seat and eight color choices for the polycarbonate back, there are actually 42 possible color combinations available for the Rivet Punk Adjustable Barstool, allowing for an extremely custom look, "on-demand". 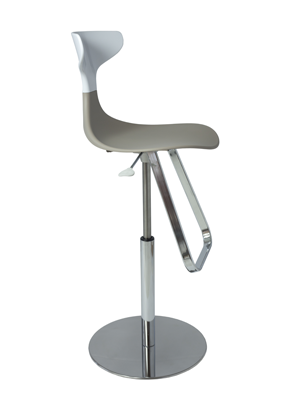 This Mind stool seems ﬂoating in the air, suspended upon a thin but at the same time robust thread.Mind bar has a sculptural pedestal that blends harmoniously with the seat and a gas-assisted adjustable lift.The acrylic seat is available in a ghost-like transparent version as well as in two polished colors : white or orange. The industrial chic Evo Bar Stool Strass P, available in two fixed heights, represents the perfect combination of tradition and innovation. This new silhouette, both comfortable and functional creates a perfect style in every environment. With a chromed or painted steel tube frame, the Evo Bar Stool Strass P is timeless as a design masterpiece.